Product #21689 | SKU ER-EK5-BLACK | 0.0 (no ratings yet) Thanks for your rating! The ETY-Kids 5 Safe-Listening In-Ear Stereo Headphones from Etymotic Research provide high-quality audio in a compact and lightweight design that's ideal for kids aged 4 and up, as well as anyone who is sensitive to loud sounds. The headphones are specially engineered with a controlled sensitivity so that they never exceed safe volume levels. Even if your music player is at its maximum setting, kids can listen safely for up to 4 hours per day. The headphones have 6mm neodymium moving coil dynamic drivers to deliver clear, natural audio with a wide frequency response and plenty of detail. 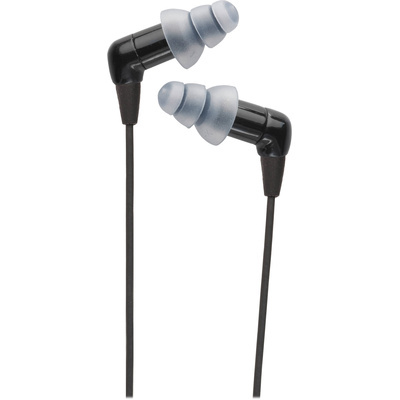 The interchangeable ACCU-Fit eartips provide a snug and comfortable fit. A proper fit creates a seal in the ears to block out ambient noise and increase perceived loudness without actually increasing volume levels. This allows users to enjoy their music instead of their surroundings.